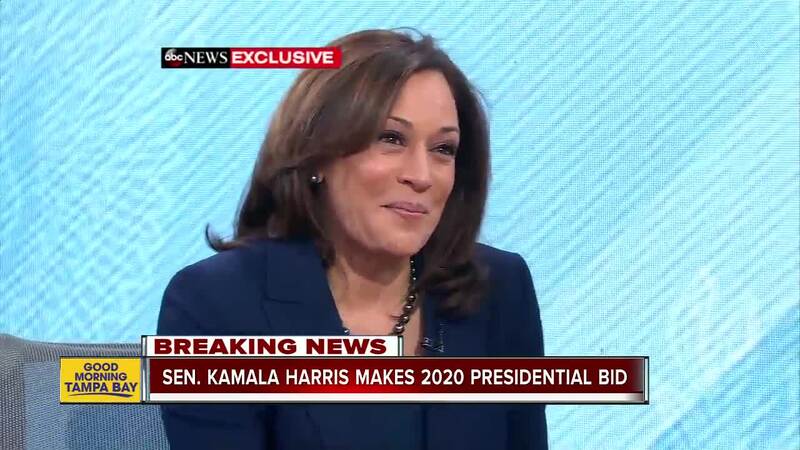 The bid for the presidency puts Harris in a position -- if she could emerge from the Democratic field and then beat Trump -- to become the first woman and woman of color to ascend to the nation's highest office. In a video released Monday morning as she made her announcement, Harris explains her interest in launching a campaign, detailing values such as "truth, justice, decency, equality, freedom [and] democracy," which she says are "all on the line now." Though she has served only two years in the Senate, Harris has drawn attention from Democrats for her trenchant examinations on the Senate Judiciary Committee, particularly during last year's Supreme Court confirmation hearings for now-Justice Brett Kavanaugh. Following the record number of women and candidates of color elected during the 2018 midterm elections, Harris -- who was born to an Indian mother and Jamaican father -- was increasingly floated as a presidential candidate who could similarly represent the increasing diversity of the United States. Copyright 2019 ABC News. All rights reserved. This material may not be published, broadcast, rewritten, or redistributed.